Time required : Most positions are required 4-5hrs. “One community, one world, one big family. Life is a celebration, Eastar Media, Event & Marketing (aka Eastar) believes there is no better way to celebrate multiculturalism and humanity than with our community. Eastar operates under a not-for-profit model and is aiming to donates its profit to local charities and international organisations that are actively working towards creating a sustainable future for us all. 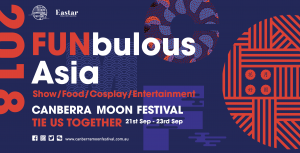 Canberra Moon Festival (aka CMF) was first developed in 2016. In 2017 the brand was officially launched as Eastar’s signature event to represent the organisation’s vision and goals. Moon Festival (aka Mid-Autumn Festival) itself in lunar calendar celebrates harvest and reunion in many Asian cultures. CMF is created to become a multicultural sensation and tourist attraction for not only those celebrate the festival but all Canberrans and visitors across Australia. It is to become the “September National Multicultural Festival”, a family friendly, fun and educational event. This year Canberra Moon Festival will return in September and be extended (from one afternoon in 2017) to a 3-day celebration with more stalls, more visitors and more fun! As a result, we will need more hands for the extended positions, from stage control to information desk, and many more to name throughout the event. Don’t worry, there are friendly staffs of CMF will provide you the essential training before the event. You will do a great job! If you are keen to participate and share the joy of multicultural celebration with the Canberra community, register today to become a volunteer of CMF2018. We look forward to having you join us on 21-23 September 2018! Please quote in application: Volunteer Call up - 2018 Canberra Moon Festival via Pro Bono Australia.